MyCentsofStyle.com Promo Code: Up to 3 Free Items, 10% off + FREE Shipping! Today only (5/17), you can use MyCentsofStyle.com promo code STYLE101 to save big at Cents of Style! You'll get up to 3 FREE items with your purchase, along with an extra 10% off your entire order AND FREE shipping with no minimum purchase! Cents of Style offers the latest accessories, shoes, scarves, and jewelry at rock bottom prices. These fashionable pieces are meant to enhance any wardrobe and confidence level. 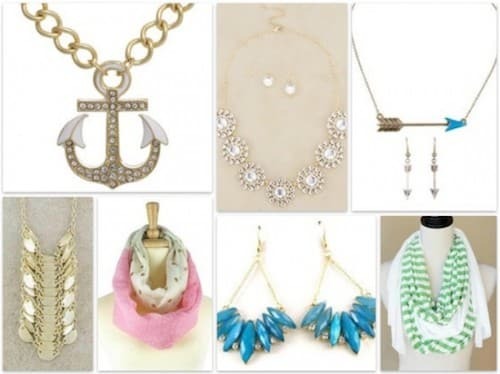 Cents of Style is proud to offer stylish, fun and affordable products that will allow you to accessorize your life. Cents of Style has some fantastic accessories at incredible prices: there are delicate chains and statement necklaces from just $5. Earrings are priced from under $7, and there are some great shoes on the cheap, too! Combine the already-low prices with the promo code extra 10% off, free shipping and freebies and you'll get a great haul for a great total! We are giving away a FREE headwrap with every order tomorrow. No minimum purchase amount required. Buy as little as $5 earrings, and get a $12.95 headwrap free. 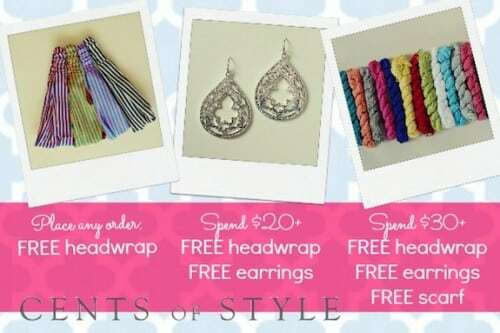 If you spend $20 at Cents of Style, you'll get a FREE headwrap and a FREE pair of earrings. That's a total value of $22.90 in free product! Finally, if you spend $30 or more, you will get a FREE headwrap, FREE earring, and a FREE scarf. That's $42+ in free products for as little as $30 spent out of pocket! Once you have your items in your cart, you will go to check out, pop-up windows will appear and prompt you to add the FREE items you qualify for. You are limited to one free headwrap, earring, and scarf per transaction. If for some reason our website has a glitch and the pop-ups do not appear, we will make sure that everyone who qualifies gets their free items shipped to them. Shop at Cents of Style today and use CentsofStyle.com promo code STYLE101 to get your freebies, free shipping and that extra discount!